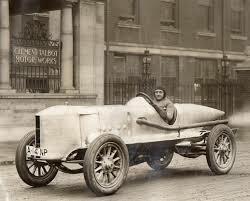 Before 1913, although some motor cars had exceeded 100mph over short measured distances, none had been driven 100 miles in one hour.This was a benchmark that car manufacturers were striving to achieve as it would be seen as an excellent way of proving – and therefore promoting – their cars. 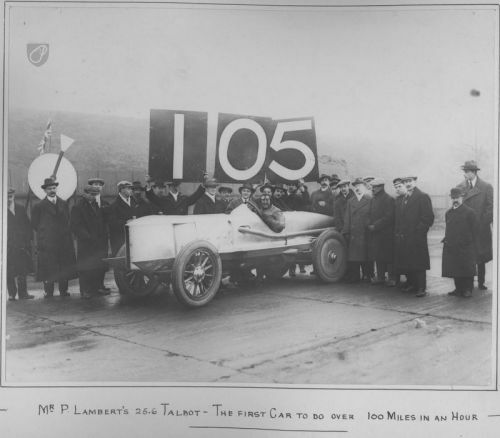 Londoner, Percy Lambert, set out to break the barrier at Brooklands in February 1913 in a 4.5 litre side-valve Talbot, a relatively small capacity engine compared to other aspirant record breakers. Furthermore, the car was basically a standard design of chassis and engine. 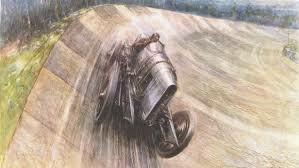 In the event, Lambert drove his Talbot 103 miles and 1407 yards in the hour, comprehensively breaking the record. He also broke several other records that day and went on to garner even more successes later the same eventful year. This was an enormous publicity coup for Clement Talbot and the firm used it effectively to promote the marque’s performance and reliability. The Talbot Owners’ Club publication, ‘1913 – Annus Mirabilis’, describes those events.